Today’s card is an example of wet into wet watercolour with some stamping added later for definition and texture. I wet the taped panel of watercolour paper then stamped a pale butterfly to give me an outline to paint over. I painted in pinks and purples and added background colour in teal. When it was dry I restamped in dark blue and did some partial stamping with the text stamp from the ‘love chapter’ transparent set. I love watching the colour blend and blur when I stamp onto wet watercolour paper. If you haven’t tried it you should; it’s fun and you can always stamp over it if it is just too loose and flowy for you! I mentioned Periscope in my last post; if you’d like to know more about it I found this helpful tutorial. By the way the latest One Layer Simplicity challenge is up and running with Ardyth. It’s all about numbers; check it out. It is magnifique! Quand j’ai un message de Bits & pièces, je sais que je ne serai jamais déçue. C’est un beau moment dans ma journée! Une pause de soleil! Merci Heather! Another stunning card! I so look forward to seeing what you have created each time I get your emails. Awesome one layer watercolored card that looks like it has more layers! Oh, Heather, I agree with Mimi – magnifique! 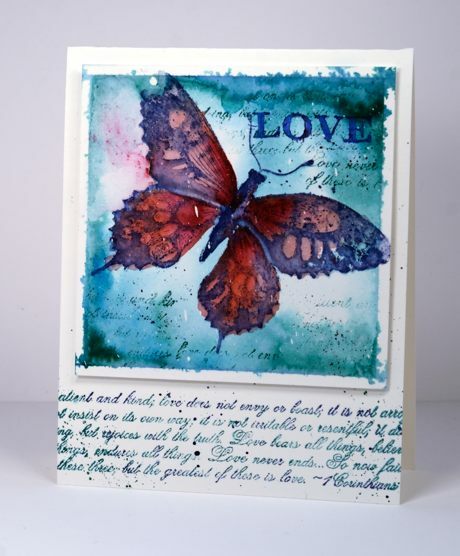 I love the Love Chapter stamp set (which I have) and love the beautiful butterfly. You sure work magic with watercoloring! Stunning colors and such a warm and loving card, my friend! Hugs!